MUMBAI: Sinhal Classes announced the list of 4 top students from standard 10 (SciMath Olympiad – Mumbai) who have been awarded with scholarships on Sinhal IIT and Medical courses. 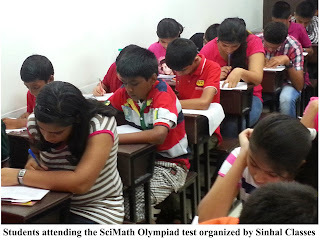 These students are qualified for the scholarships through SciMath Olympiad Tests conducted in Mumbai recently. The top 4 rank holders are Tezan Sahu, from St Mary's High School, Vashi, Ankit Pandey from Abhinav Vidyalay, Dombivali, Siddharth Shah from Lilavati Bai Podar, Santacruz and Anshul Thomar from Atomic Energy Central School 4, Govandi respectively. All the winners are from CBSE board they will get scholarships along with other rewards like Tablets, plus 100 per cent scholarship for standard 10th test series for Sinhal IIT and Medical courses. Conducted on 28 September 2014 at various centres across Mumbai, Navi Mumbai and Thane presented by Sinhal Classes & Times NIE, a total of 3156 students applied for standard 10th SciMath Olympiad Test in Mumbai and 2206 students got qualified in this prestigious Inter-school SciMath Quiz competition. Mumbai's prestigious Sinhal Classes is all set to take students for a visit to NASA, after short listing the winners through the SciMath Olympiad, the biggest ever Inter-school Quiz exclusively conducted for the students of Grade 7th to 10th from ICSE, CBSE, SSC, IG, and IB Board by Sinhal Classes. Sinhal Classes is the first institute in Mumbai offered students the chance to win scholarships of up to Rs 4.5 lakh and visit NASA. The Top 3 rank holders who are going to fly to NASA will be declared after 26th January, once the rest of India results are declared. "Through SciMath Olympiad, the biggest Inter-school Quiz competition we offer the students a golden opportunity to visit NASA and get a feel of it," says Mr. Sudhanshu Sinhal, Managing Director, Sinhal Classes. "This is a small effort from our part to develop future leaders, scientists and visionaries, the basic foundation of which lies in the clarity of thought," he concludes. Needless to mention that NASA is the epitome of applied sciences, an institution immortal of its endeavours in space. It is the dream of a student to visit NASA and seeing the Apollo Rockets that took Man to the Moon or observing the Space Shuttle. Dreams of flight have captured the human imagination for centuries. Children worldwide imagine dancing among the stars and soaring into the blue. Younger generations are always interested in aviation and space sciences. SciMath Olympiad will make the winner's visions become reality. The aim of the competition was to test innate problem solving skills and carves out the ingenuity in children, inculcating competitive spirit in every child, helping in proper utilization of leisure time and giving a boost to the child's confidence. A total of 45,000 plus students were participated in this spectacular event. No Comment to " Sinhal Classes award scholarships for SciMath Olympiad - Mumbai toppers from class 10 "